Friends, it’s dark days when Rory Gilmore stands as the voice of reason, but that’s exactly where we are in “Emily Says Hello.” Only Rory, it seems, can see the forest for the goddamn trees, to know that Christopher is about to mess everything up (again) for her mom. Lorelai’s blind side when it comes to Christopher is confounding. 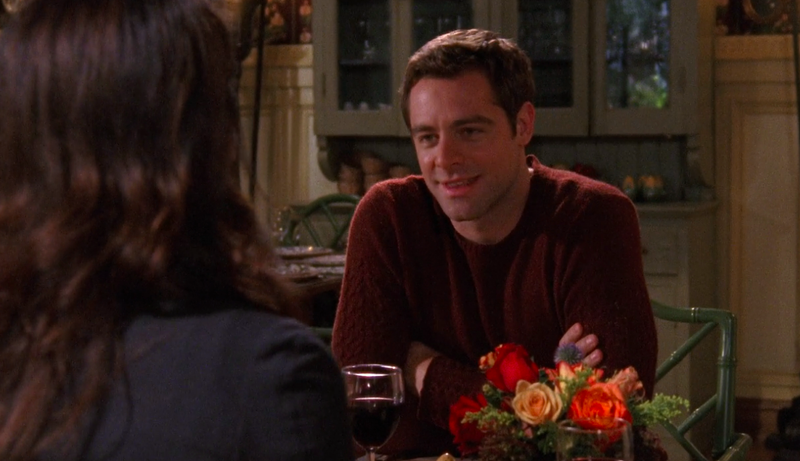 The first time we meet him, in season one’s “Christopher,” it’s Rory who’s all starry-eyed and Lorelai who’s cautious. Then the two almost got together at the end of season two, but are sidelined by Sherry’s pregnancy. Now Lorelai’s feelings toward “Chris” seem to be an unhealthy blend of nostalgia and pining for that guy she just can’t get over. And she knows that there’s something still there, otherwise why would she lie to Rory in the first place? "Emily Says Hello" / "But Not As Cute As Pushkin"
Possessing neither of those things, I’m completely aligned with Rory. She asked him to do one thing in her entire two decades of life—stay away from her mom—and he can’t even do that. When caught, and confronted, he unrolls a long litany of lame excuses (It’s the Christopher way), none of which even approach him accepting any responsibility for hanging Rory out to dry: “This wasn’t my idea,” “I’ve done nothing wrong here,” “You can not make me the bad guy,” “I’m your father, I think that demands a little bit of respect,” even though he’s spent most of that relationship ignoring his firstborn. There are a variety of options Christopher could have done instead: Told Lorelai he was too busy. Out of town. Or called Rory to give her a heads-up about the lunch, instead of sneaking around about it. In practically every instance, Christopher is the absolute worst. He’s a less-confident version of a grown-up Logan: born into privilege, fails to break out of it, and is prepared to whine about his terrible fate until the end of time. Of course, Emily has nothing to worry about, as her years of masterfully engineering every kind of social event mean that she of course is the most delightful dinner companion, able to extrapolate on the symphony, wine, travel, with unfaltering aplomb. But her perfect evening leaves her feeling hollow, and her tears that end the episode are heart-wrenching. I had forgotten that Marty shows up so much in season five before Logan takes over. Was he just there to show that Rory was never going to be into just a nice guy who liked her? (See also: Paul from the revival.) Writer Rebecca Sinclair (this is the first of her several episodes) was throwing a lot of Pretty In Pink grenades at us: Lorelai goes off on Andrew McCarthy after her St. Elmo’s Fire movie date with Luke, and Marty’s study date with Rory is almost an exact replica of Duckie in Andie’s in PIP, where studying leads to some emotional reveals, but in the end, just like Duckie, Marty fails to tell Rory how he really feels. And Logan is certainly a Blaine type, although Blaine was never that obnoxious. Maybe Steff. At least Luke has T.J. to talk to… actually, that’s worse. T.J. only really appears as a sounding board to show that Luke really is troubled by the looming specter of Christopher, and as we’ll see in upcoming episodes, as well he should be. But even though Luke has only had two or three relationships (apparently) in his entire life, even he has to know how assholey and condescending it sounds to tell Lorelai that he’s okay with her Christopher lunch. But maybe that helps her avoid picking up the phone when Christopher calls later, which is good, because otherwise I might have tossed the TV/laptop right out the window. “Pushkin” is a weird episode, as Amy Sherman-Palladino ones are usually exemplary, and this one is not. But there are strong moments when it’s so obvious who ASP really enjoys writing for. Namely, one Paris Gellar. Paris is never better than when she gets to go off on whoever is unlucky enough to be in her path, so speed-dating is an ideal platform for peak-Paris-ness. It also, fortunately forces Paris and Doyle together, obviously a (mostly) perfect pairing. Unfortunately the rest of the episode—particularly Rory’s dragging around young Anna Fairchild from Chilton—falls flat. The joke of Rory trying to thrill Anna with the high-stakes going on at Yale and have everything devolve into fights over things like pen caps got old really quickly. And even Rory can’t be clueless enough not get to get how boring lectures about benches must be. The whole scenario is not much to hang a whole episode on. Also, how can the main hangout for everyone at Yale be called “The Pub”? Is it down the street from the graduate student hangout called “The Bar”? Because we know how much Sherman-Palladino loves the Life And Death Brigade, there’s of course a ridiculous prank by Logan, Colin, and Finn as they invade Rory’s philosophy seminar. Guessing these guys don’t ever bother going to class themselves, and Logan’s insistence that he can just use his connections to smooth everything out for Rory is annoying. “Bring a book to sniff!” was kind kind of funny though; don’t make me like you, Logan. It was nice to see Richard and Rory finally give these three some comeuppance, also. Worst of all, the dickishness of Luke kicks off in earnest. “It’s fine about your lunch” is bad enough, but now he’s screaming at little old ladies as his annual dark day approaches. Yes, just a necessary plot machination to stick a wedge between Lorelai and Luke while she and Christopher closer together, but it’s somewhat damaging to this character we’re supposed to like. We know Luke has a temper, but other than Taylor or a random customer I don’t know if we’ve ever seen him be actually be straight-up mean to anyone. Then, he even goes off on Lorelai after she saves his father’s boat. Yes, she’s headstrong, but her heart at least was in the right place. Luke finally revisiting the boat at the end of the episode seems to indicate that she made the right decision, but Luke and Lorelai’s first real fight is already on the books. Where are the big-screen showings of St. Elmo’s Fire? Because I would be there in a second. Rory says that it’s been a busy week, including a breakup with her boyfriend. But there’s already been another Friday night dinner, which would suggest that more than a week had past. Total nitpicking, but “it’s ben a rough few weeks” would have covered it. Emily’s date, Simon, was played by Larry Pine, who also played the nefarious Tad Channing on my favorite college soap, As The World Turns (RIP). Best Gilmore outfit: Lauren Graham looks really stunning in red. Great cutout sweater at the pre-Friday night dinner drinks with her father. Worst Gilmore outfit: Rory’s scarf in the “Pushkin” episode barely qualifies as a scarf. It’s more like a thick string. Sorry this is up a little late today: Many Halloween hijinks happening this weekend. Fortunately, am now fueled by at least three mini 100 Grand bars. Next week: Ugh, more Christopher. Happy Halloween, everybody!